India has 100,087 km (62,191 miles) of National Highways (NH) connecting all the major cities and state capitals as of June 2016. National highways comprise 1.7% of India’s total road network but carry about 40% of road traffic. Most of them have two lanes. About 26,000 km (16,000 mi) have been widened to four lanes with two lanes in each direction as of May 2016. India has the distinction of having the world’s second highest-altitude motor highway Leh-Manali Highway, connecting Shimla to Leh in Ladakh, Kashmir. National highways form the economic backbone of the country and have often facilitated development along their routes, and many new towns have sprung up along major highways. The National road grid in India has been getting a good boost ever since our former Prime Minister Shri. Atal Behari Vajpayee’s National highway development project (NHD) started materializing in stages. Whenever you refer to Google Map, you must have noticed symbols like AH, NH, and SH. The following are the explanations for these respective codes. 1. National Highways (NH): These are major highways in India that provide connectivity to all cities and states. National Highways are maintained by the Government of India (i.e. NHAI). 2. State Highways (SH): State highways span over 150,000 KM in length and are managed by the state governments to provide accessibility and city/town inter-connectivity within each state. 3. Great Asian Highways (AH): Asian Highways are part of the cooperative project within Asian countries. While in principle, the National Highways in India themselves forms the AH stretch in India, it’s good to understand them from the map’s point of view. You will encounter many places in a map where the highway is referred to as an Asian Highway or AH. In reality, though, there’s no separate road network for AHs but they consume the respective major highways in the participating countries to form the Asian Highway grid. You can read more about Asian Highways at Wikipedia. Now let us go to our main topic. Until 2010, the Indian highways were numbered in a very confusing manner. The numbers were assigned without any logic in any way. 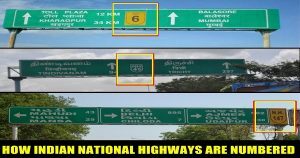 However, the Government of India took a major decision in 2010 to rationalize the highway numbers in a way that the number provides some clue about the geographic location and the direction of a particular highway. Ministry of Road Transport and Highways, Government of India adopted a new systematic numbering of national highways in April 2010. The new system will indicate the direction of national highways whether it is East-West (Odd numbers) or North-South (Even numbers) and also the geographical region where they are located, increasing from east to west and from north to south. 1. All North-South highways will carry EVEN number. 2. All East-West highways will have ODD numbers. 3. All major Highways will be a single digit or double digit in the number. 4. North-South highways will increase their numbers from East to West. For example, a particular North-South highway in Central India or Western India will have a higher number than the one in East India. To be specific, now you can guess that NH4 is somewhere in East India where as Highway 44 may be towards the west of India while both runs north-south due to the even numbering. 5. Similarly, East-West highways will increase their numbers as we move from North to South. By this logic, NH1 will be running East-West somewhere in North India while NH 83 may be somewhere down south. Of course, there may be a minor confusion among some roads that may be running diagonally in stretches. 6. THREE-digit numbered highways are secondary routes or branches of the main highway. For example, 144, 244, 344 etc will be the branches of the main National Highway 44. Please note that since NH44 (NS Corridor) runs the length of the country from North to South a side shot says 144 maybe up north while something like 944 maybe down south. 7. Suffixes A, B, C, D etc are added to the three digit sub-highways to indicate very small spin-offs or stretches of sub-highways. For example, 966A, 527B etc. So next time when you are driving based on the map or navigation device and when you see/hear something like ‘Turn left to Old NH47’ you should remember that the particular highway is being re-numbered. This way, the Indian National Highways are numbered. If we did miss any point and you know that, please let us know in the comments section below.